26% of TAP Air Portugal passengers were over 60. The most popular flight route for TAP Air Portugal was - Lisbon to Boston. The top travel destinations for TAP Air Portugal passengers were Boston, Newark, Lisbon. The most popular airport for TAP Air Portugal was Portela Airport. TAP Portugal is the leading airline of Portugal, headquartered at Lisbon, which also serves as its hub. The airline is in operation since 1946. TAP Portugal has its secondary hub at Porto Francisco Sa Cameiro Airport and Focus City at Madeira Airport. 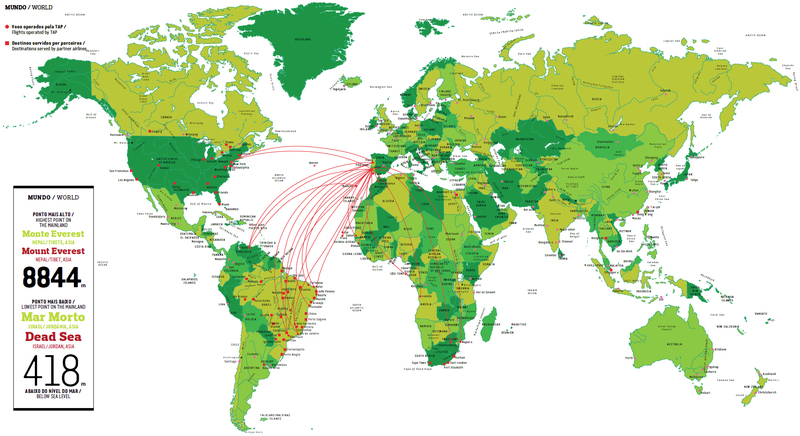 TAP's network boasts 81 destinations in over 34 countries worldwide. From the U.S., TAP currently flies non-stop daily flights to Lisbon and Porto with connections to 45 destinations in Europe and 13 in Africa. TAP's reach in the United States extends to over 40 major cities through its codeshare agreements with United Airlines and JetBlue that allow travelers to connect seamless to TAP's gateway cities. TAP is the member of Star Alliance, and its subsidiary include TAP Express. TAP has launched a new product - Portugal Stopover. With this, travelers can enjoy upto 3 nights in Lisbon while on their way to another European destination without any extra airfare. Passengers can also enjoy discounted nights, free experiences, and also free bottle of wines at partner restaurants. TAP has renovated its interior cabins to include a new TAP Executive cabin featuring lie-flat seats, a brand new Economy Plus Cabin having extra legroom, and a sleek Economy Cabin featuring leather seats. For the entertainment of passengers, cabins feature fully interactive on-demand audio and video systems. There’re over 20 movies to choose from, and over 20 hours of series and documentaries. Travelers can also enjoy daily world news, ten video game channels, over 900 songs, 12 TAP Radio channels, newspaper and magazines, along with Wi-Fi. GastronomyExecutive Class menus lay emphasis on Portuguese products, flavors, and traditions to bolster TAP’s image as a promoter of national products. Dinner and breakfast are offered on all long-haul flights from North American gateways to Lisbon and Porto. Comfort Executive Class features lie-flat seats that can be transformed into real beds. * The seats feature hypoallergenic pillows that are covered with a soft-tough material specially designed for TAP Portugal. The seats also have large soft quilts. Comfort Executive Class seats feature electronic, noise reduction headphones with cutting edge audio technology, laptop charging sockets, and eco-friendly amenity kits. There’s 34 inch pitch between seats in Economy Plus, and 31 inch pitch between seats in Economy Class. There’s individual on-demand entertainment system, and complimentary pillows and blankets. TAP Air Portugal Hub - Airports used as transfer points to get passengers to their intended destination.